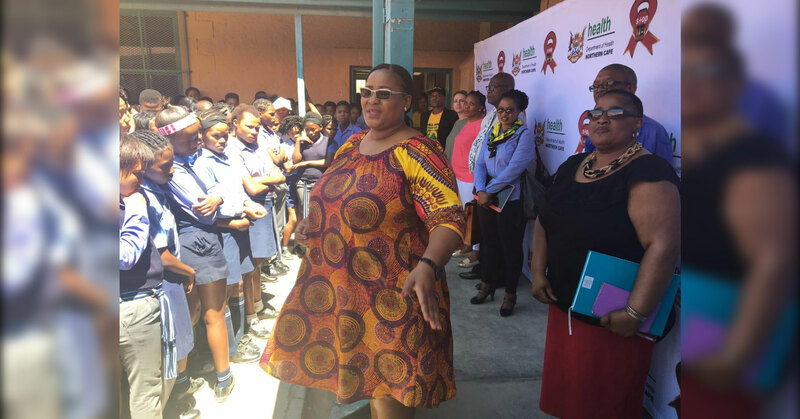 16 January – In an attempt to improve the health and well-being of our children at schools, the Northern Cape, MEC for Health Ms Fufe Makatong donated sanitary towels, school uniform vouchers and dignity packs for 300 deserving learners in the Pixley Ka Seme District. The MEC’s visit to Phakamisa High School, Willie Theron Primary School and Orion High School was part of strengthening the School Health Programme in the province. The MEC has committed towards rolling-out this campaign to other districts in the endeavour to improve children’s health and reducing health barriers to learning, as well as supporting learners to stay in school. During the visit, learners were screened for nutritional and dental needs. The target group for the school health programme is the entire population of learners including learners with special needs. The service is tailored according to the different developmental stages of childhood and specific health needs in various communities and schools. The effective monitoring and evaluation provide government with an opportunity to address potential deficiencies that might have a negative impact towards achieving key targets set over the years. It also assists towards evidence-based planning and generating credible evidence for rational decision-making in the delivery of services to communities. School Health programmes have an important role in ensuring that the Millennium Development Goals 2 and 3, which focus on achieving universal primary education and eliminating gender disparities in primary and secondary education, are achieved. It also focuses on intensifying the sexual and reproductive health campaign and will greatly assist towards combating HIV and AIDS, and reducing maternal mortality and teenage pregnancy rates.